If you had been a regular reader of this Page, you would have realised that I am not very much active on the Blogging Scene.But I do still try my level best to keep this page alive and kicking. You might also know that I get super powers from my red underwears. If your memory is strong, you would also remember that I had the habit of bed wetting till I was 12 years old. Now don't give that "OMG- 12 YEARS?" expression. I am pretty sure that you would have done that too. I am writing this blog entry because a female fan of mine sent a mail request to me asking me to write a blog on my "NAME". OK. I admit. It was not a mail. It was just a chat session. A blog on my name- "Chriz" ? Now you might be racking your head about the Title of this post. What is the relationship between Chriz and Piss? Yes there is a big relationship between the name Chriz and Piss. I am not talking about my bed wetting days. It was a different era. I was in class 7. I was no more a bed wetter. Jebaraj, Shabir, Subramanian and I were great friends. We were the only four guys in our class who had our own Bicycles. Jebaraj and Shabir had an Atlas Cycle. Subramanian had a BSA SLR and I had a Rockshox. We went to school in our Bicycles. Even though I had a better cycle, the other three were faster than me in pedaling. I always came last when ever we had cycling races. Now, for the first time in my Blog, I am gonna reveal my full name. My Full name is "Prason Christopher Robin Selvanayagam". The last name is a part and parcel of our family Tradition. It is my great grandfather's name and everyone in our family has that name attached to our Given names. 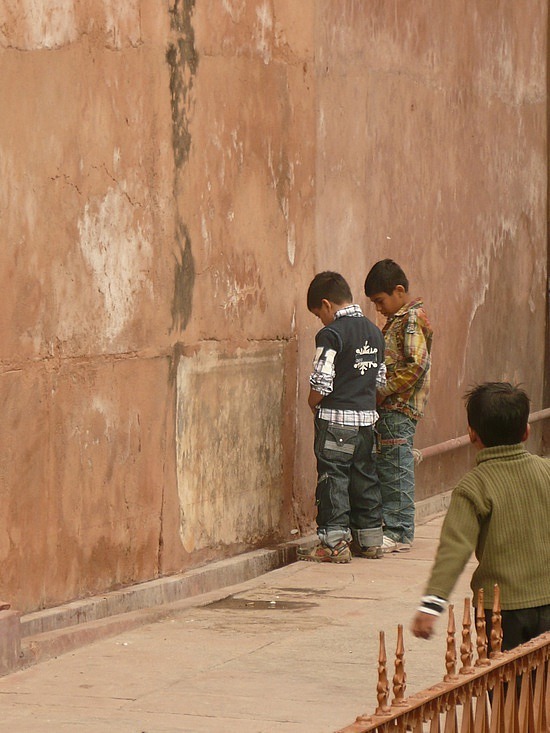 One evening after our school got over, we were returning in our bicycles, when suddenly Subramanian stopped in the corner of the road and went to the corner and started peeing on the wall. If you had been on roadtrips, you would know that when some one goes, everyone has to go. I am not sure whether it has any relationship to Murphy's laws. The next moment, all of us were peeing on the wall. This peeing on the wall activity became an everyday activity. We chose a big Brick wall as our peeing spot . In the beginning, it was just an activity, but very soon, we invented games through this activity. We Drew circles , Sinusoidal wave forms and many other designs on the wall. Then we also had this competition on who can pee the longest? Shabir set a record of 5 meters. The record still stands in his name. We devised new techniques to specialise in this art form. As soon as school got over, we would all drink as much water as our bladders could hold and would cycle all the way to the wall for the action. One day Shabir (He was my Villain in School. He was in Love with the same girl I loved) said ," Guys we will play a new game. We will write our names on the wall". That evening, I drank two litres of water and I could hardly cycle my way to the wall. My friends were already waiting for me at the wall. The game started. Shabir was successful in writing 4 letters in his name (SHAB). Jebaraj did 5 (JEBAR). Subramanian also did 5 ( SUBRA). I completed 6 letters (PRASON). A new champion was born. Peeing your name on the wall is not an easy task. It requires precision skills, bladder control, hand-eye co-ordination, Leg position. Stopping-when required and Repositioning of legs after one letter is written on the wall. If you had played games like this, you would know the difficulty of playing this game. Very soon we were becoming experts in this art. But there was a problem. As my name was very long, I was never able to completely write my name on the wall. The maximum, I could do was complete my first two names before I ran out of fuel. One day Shabir dropped a bomb-shell. He said, "Guys let us have a competition to find the fastest writer of our names on the wall". My bladder almost died when my mind thought about the long name that I had to write on the wall. But I decided to win atleast this game, because I came last in the previous two games -1) Bicycling and 2) Longest Pee-er competition. "Is this what they call -Peer pressure? ", I thought to myself. That afternoon, I made an announcement in Class, " Guys! From Today, you can call me Chriz". The girls liked this new name. Renu (My girlfriend) came to me, touched my shoulder and said, "Chriz! Nice name". I went to cloud 9. My four friends were caught offguard. They never suspected anything. battle. We also took our classmate Shankar along with us to officiate the proceedings. I even suggested to invite our class girls to cheer us in the competition. As always,My suggestion was not accepted. "On your Mark, Get, Set, Go" - Shankar's voice echoed through our ear drums. The competition started. Bikes, Buses and cars zoomed behind us on the main road. I was the first to finish it. I exactly took 86 seconds to accomplish the task "CHRIZ". The others were shocked. They realised the reason behind my name changing announcement. They couldn't accept defeat like gentlemen. They ganged up against me and beat me to pulp. My white shirt was covered with dust and sand. After showing their rage on me, they left me. I stood up and looked at the wall. The writing had already dried. I had tears in my eyes. My friends were sorry too. They had tears in their eyes too. They knew who the winner was. We took our cycles and slowly pedalled it into sunset. From that day onwards, everyone started calling me "Chriz"
you develop posts out of nowhere man..awesomee..
hahaha... excellent post after a long time! I agree with Bhavin.... after a long long time indeed. Good way to gee oneself up a little at the end of a long and tired day, Chriz! :) Pee-eer pressure-aah? Chancey-illa?! yengendhu ipdi??? (i) supposed to be 'racking' I think; there was a typo there: 'raking' you had spelt it! (ii) it has to be 'turn back' or 'return': 'return back' is superfluous as an expression. Thanks for correcting me. The changes have come into effect. What a precision skills you have.. I really appriciate your greate job my friend Chriz..